All persons entering the pool must check in and pay the appropriate fees or present memberships or swim card. Arlington Residents receive a discounted rate, when presenting proof of residency, and some form or identification with a photograph. Persons enrolled in Community Classes, private lessons, the Arlington Aquatic Club or other team renting the swimming pool will not be charged admission during the time of the class or practice. Fees may be paid by VISA/MasterCard, cash or check to Arlington Public Schools. Persons purchasing a membership or swim pass are required to complete and sign a “Hold Harmless” form. 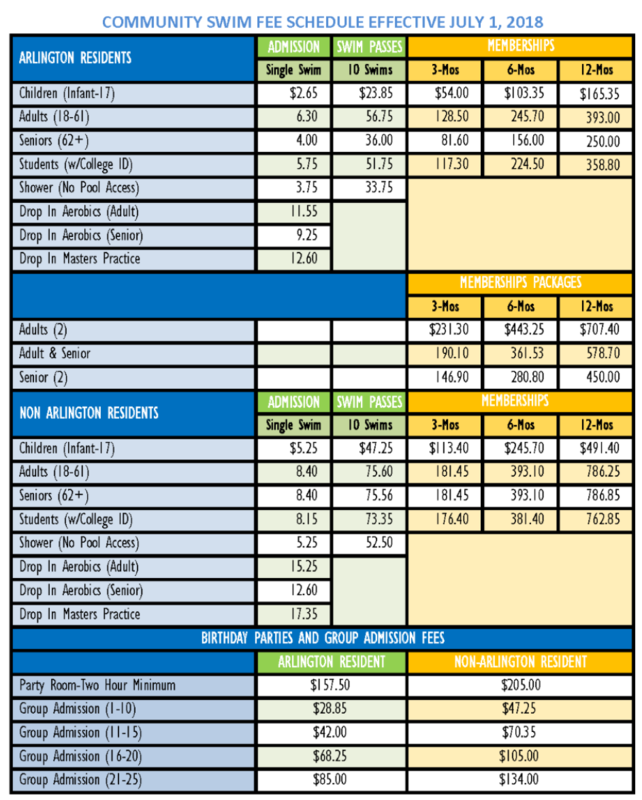 Swim Passes are non-refundable and are valid for one year from the day of purchase. Persons paying general admission are required to sign-in.